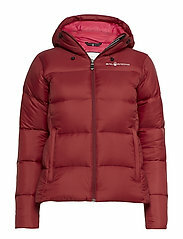 This jacket keeps you warm in winter with its Bluesign® and Responsible Down Standard (RDS) Certified down filling. Sail Racing. Tuulenpitävä. Hengittävyys: 5000 g/m2/24h. Responsible Down Standard (RDS) certified down filling offers optimal insulation and it is ethically sourced to ensure animal welfare.. Fluorocarbon-free: sustainable water repellent fabric treatment.. Vettähylkivä. Less chemicals. Eettisesti valmistettua villaa.. Fleece.